There are so many people out there in the big, wide world doing incredible work, people like Warren Truitt at New York Public Library (and creator of the rockinest Cool Kids Music blog around) . What is even more awe-inspiring is that so many of these folks–like Warren–are simply doing what comes naturally to them with results that are nothing short of remarkable. They’re moving with the intuition, truth and daring actions that are trying to move through them with the work they do…and because of it lives are made better, kids are enchanted, communities are brightened and the world is a kinder, smarter place to live. So often we never hear about these folks. We see their work or it may be lauded quietly in small circles. And ultimately, that is the way that is best…to do great work, great things happen and then they move on to more great things. Lately I find myself often thinking or saying “Hat’s off to you!” to the folks I see making the world a more golden place by just doing what they do–deeply, with commitment, and with joy. That “hat’s off” often becomes a “hatzoff!” when I am so moved by the enormity of the drive and commitment of one person’s effort or vision. Having said all that, I am now taking the hat off my own head and offering up the the Hatzoff! Award to people who are doing what they do best with magnificent results. 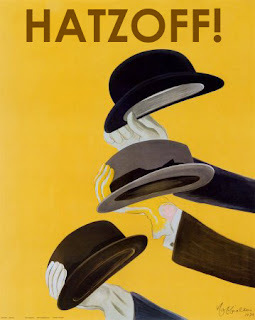 What this means is just what I said…You get the hat off my head mailed to you when you receive the Hatzoff! Award. I’ll send this at my own expense with a note and any other little sumthing, sumthing I may be able to muster up to say a whole-hearted “Thank you, for the quite (and often quiet) incredible work you do. Yep, you heard me right. Most people who know me know that I wear a whole bunch of different hats (yes, in both senses of the phrase). I can think of no better way to say “here’s to you” than this simple little gesture. 1. Anyone can “nominate” anyone else who they feel is doing plain-old-simple-but-tremendous work that achieves remarkable results by simply emailing me at yestoknow@gmail.com. (There is no form or application needed, just send me a few lines and tell me about what this person is doing out there in the world and why they deserve a big ole “Hatzoff!”) For instances, it may be the librarian who created an incredible program that met the needs of an unserved group; it may be the neighbor who took it upon herself to make sure older members of her neighborhood got the information they needed; it may be someone that spoke up when no one else would and made a difference in their community; it may be the originator of an super-sizzed-out virtual discussion. You get to decide. I just need to hear about it. Tell me the gist of it by emailing me at yestoknow@gmail.com . 3. In case you’re wondering: This thing could really take off, you are saying…how will you pay for all the postage and–,more importantly–how will you be able to replace your hat collection? Well, I thought about this all afternoon. I figure that if it comes to it, I can just let go of a few of my hurried lunches that I often have each week (because I forget to pack my lunch) and see if this takes care of it. I did the math today and it’s staggering what these 2-3 convenient, but often less-than-thrilling lunches can cost each week! I’d much rather spend the money on recognizing someone great than have another wilted overpriced salad and iced tea. 4. I’ll mail the repient their Hatzoff! Award (yep, the hat off my head and my sincere appreciation) and then post information about them and the great work they are doing right here at http://www.yestoknow.com/. 5. Their is no limit to how many nominations or Hatzoff Awards that can be made. I’ll do this on an ongoing basis. I’m ready to do a little (or lots) of celebrating all the great people around me and finding out about all those I don’t yet know about. The only limitation comes in how fast you can send the emails and how fast I can get hats in boxes and postage slapped on. Now, you may see that I already let the cat out of the bag last week when I posted the first Hatzoff Award in an earlier blog. With great joy and appreciation, I again announce the first Hatzoff Award goes to Warren Truitt, Children’s Librarian extraordinaire and creator of Kids Music That Rocks ! Warren will be receiving the very hat below (being tipped in his honor) along with a box full of appreciation. Now, it’s your turn to let me hear who deserves the next Hatzoff Award!